As you might know, because we have mentioned it a whole bunch of times because we’re still excited by it, Bill Prady, the co-creator/producer of “The Big Bang Theory”, invited us out to visit the set of the show. We brought a whole bunch of NASA goodies with us to share with the writers and production staff. Sure, we hoped some of them might find their way onto the set – but primarily, we thought that there were probably some geeks involved with the show that might enjoy having them. Once the James Webb Space Telescope project folks (who I work for) heard where we were going, they offered to send along a small, scale model for the show. Thankfully I had a friend in LA, who was kind enough to let me ship her the model, a poster tube, and another box full of stickers, lithos, bookmarks, magnets, note pads, diffraction grating glasses, an SDO LEGO kit, and various other things, so that we didn’t have to carry all that on the plane! After our set tour, we loaded Bill’s assistant, Tara, down with the model and two NASA bags full of stuff. And though we had no expectations, you can bet we kept our eyes peeled during the episodes that were taped after our visit! During Thursday, November 4th’s episode, “The Apology Insufficiency,” we were rewarded! “The Apology Insufficiency” — Sheldon’s answers during an FBI interview put Wolowitz’s security clearance in jeopardy, on THE BIG BANG THEORY, Thursday, Nov. 4 (8:00-8:31 PM, ET/PT) on the CBS Television Network. Eliza Dushku pictured here with Kunal Nayyar, guest stars as the agent interviewing Wolowitz’s friends. As I watched the scene that takes place in astrophysicist Rajesh Koothrappali’s apartment, I noticed a space shuttle model next to his front door. And then….yes! The glass-encased Webb model was sitting next to it on the shelf! And above it was…an SDO poster! 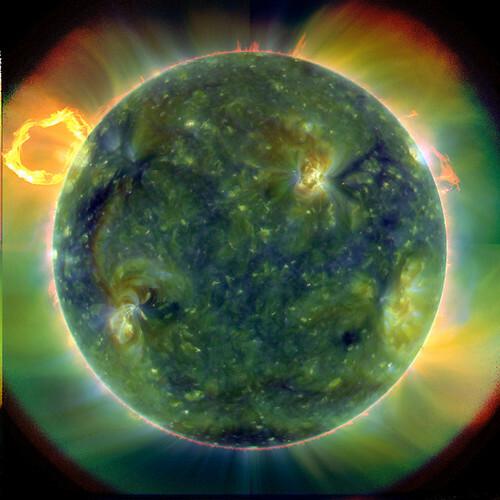 This is the SDO image in poster on the wall. 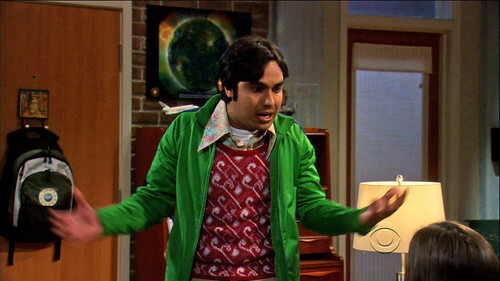 Later in the scene, Raj walks over to the fridge – and the NASA logo sticker on its door was unmistakable! 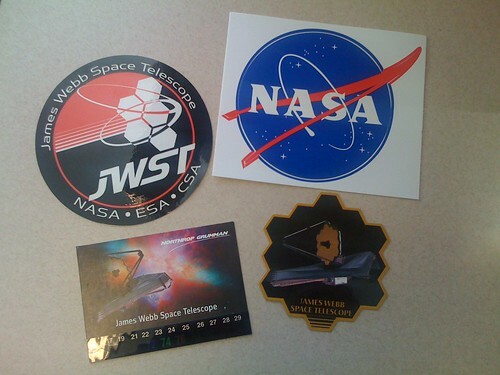 Next to it was a red and black JWST logo! Below some of the other things on the fridge was our newish hexagonal mirror magnet and the thermometer magnet kindly sent along by Northrop Grumman, Webb’s prime contractor. 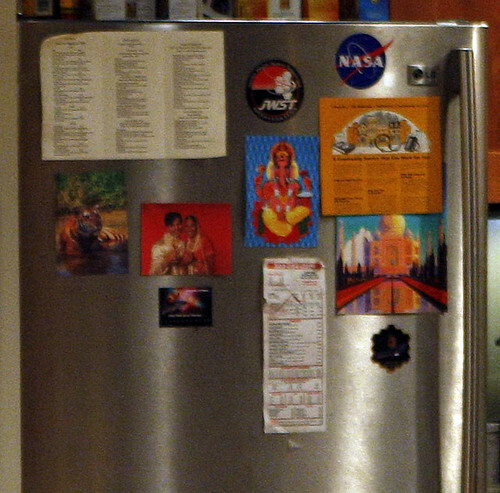 CBS very kindly sent us the above large still of Raj’s apartment, and even cropped out this bigger picture of the refrigerator for us to use. We were all so excited to see our NASA stuff on the show and flattered and happy that they thought it worth using to decorate their set! I know I also loved that they used it in the astrophysicist character’s apartment! We also found out that they used another SDO poster in this scene with Sheldon and real-life astronomer Neil deGrasse Tyson. 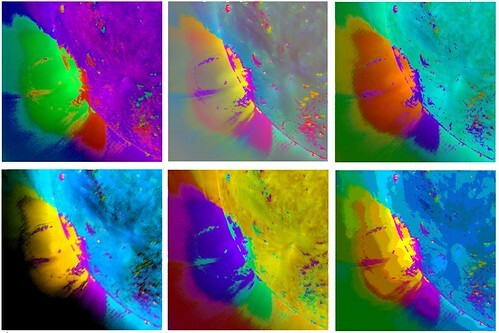 It’s Warhol-esque. Can you spot it? Thank you again, CBS, Bill Prady, and Tara Hernandez! You made us NASA nerds very happy! All images used with permission of CBS. Congrats! But you may not realize that they thought you being there was cool too. Danny – It easy to forget, like Sara said. Most of us here sit in front of computers all day. Then we’ll get to witness something cool that reminds us of where we work. We just have to remember that where we work is special too. :-) Thanks for your comment! (Sorry, just downloading my first cup of coffee for the day.) All that was just to say — good for you guys for working somewhere very special!